This facility was given a 5 star review from Karla. See what was written below. Operated by American Addiction Centers, Oxford Treatment Center adheres to a philosophy that addresses the mind, body, and spirit. They are committed to investing in the whole person, because finding new ways to experience and enjoy life is key to sustaining recovery from drug and alcohol addiction. After patients at Oxford Treatment Center have finished the first step of medical detoxification and stabilization, they transition into the Residential Treatment portion of the program. Separated from the substances that have controlled their lives and removed from the daily patterns that facilitated addiction, patients begin the hard, hopeful work of re-building their lives. It's amazing. You show up and you're anxious and nervous and don't want to be here. But I knew I had to come and I was committed from day one. My use had increased, my drinking had increased, and I was aware of it. I knew I had been a social drinker, if you will, for many years... a highly functioning alcoholic. Things kind of unraveled a little bit. I had some personal losses with family that were very close to me and it came to a point I had some issues at work and part of it was certainly involved with the alcohol. I went home, called my wife, and said ‘I’m ready to go.’ One of the biggest things that I can't express enough is the fellowship here. So many people say, 'I’m not going to know anybody,' 'I'm nervous,' 'I'm not going to be able to talk to people.' The people that are here are just absolutely amazing. I've made better friends here than in the last 25 years. I wish I'd have done this 10 years ago. So many people try to do this on their own -- I had tried to do it on my own -- and end up seriously ill. [They] end up in the hospital with seizures… It was just paramount that I do it the right way. My doctor [and family] urged me, and I finally made the conscious decision that this is the only way to do it... for your long-term health and to not end up dead. When I got clean life became more important again. My health became important again. I wanted to do more activities with my life. I wasn’t struggling anymore with waking up and trying to find a drug. I was waking up and wanting to achieve something each day. My life was in shambles before I got here. I’d hurt everyone in my life – the people closest to me, a family, I’d lost a job, I’d lost everything. I found myself in jail with no one and nothing. Recovery has brought me a new way of life. It’s brought me to a place in life where I never thought I could be or would get. I thought that I would need substances to enhance my life or to deal with things that I struggle with. Through the Oxford Center and through the 12-step program, it’s given me a stepping stone in life to become a better person and to be clean. I’ve come to a place that was structured, clean, peaceful, and away from the chaos that I was living – you know, the everyday life here is something that I was able to get used to very quickly. My thing was to not sit in a classroom all day. The activities here [I liked]. I was able to do the equine therapy, the ropes course, able to sit with my counselor and look over a lake. It was amazing. The peace and serenity of the grounds itself – I was quite excited about it. Where I was in my life, I was ready to get clean. So I was excited to be here but I didn’t know what this place had to offer when I first got here but I was willing to give it a try. Being able to know that someone was looking after me 24 hours a day, that I was going to get three meals a day and be fully taken care of… it was very comforting. And they did a great job at it. Recovery is possible for anyone that’s willing to do something different and wants something different in their life. Mark Sawyer most recently served as CEO at Acadia Healthcare's Twelve Oaks Recovery Center in Navarre, Fla. During his six-year tenure at Twelve Oaks, Sawyer served as controller, CFO, director of operations and CEO. Under his leadership, the center made strides in client satisfaction, employee engagement and financial metrics, earning Acadia's first Recovery Division Clinical Excellence Award in 2016. A veteran of the U.S. Navy, Chip provides oversight for all Oxford Treatment Center’s clinical operations. He has served as outpatient services manager and provided direct patient care in all clinical programs, as well as serving as a group facilitator for our Family Program. His prior experience includes working at the National Council on Alcohol and Drug Dependence of Northeast Mississippi (NCADD) in Tupelo. Chip holds a bachelor of science degree in nursing from Mississippi University for Women and a master of education degree in Clinical Mental Health Counseling from Delta State University. He is a Licensed Professional Counselor and Nationally Certified Counselor, and a Certified Alcohol and Drug Counselor through the Mississippi Association of Addiction Professionals (MAAP). Fig. 1 - Rehabs.com surveyed over 26 thousand alumni, their loved ones, and staff of treatment facilities to reveal how addiction treatment recipients feel about the quality of care they receive. 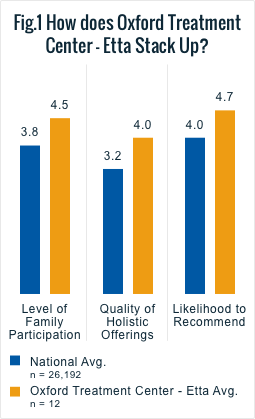 Respondents associated with Oxford Treatment Center - Etta report, on average, superior ratings for aspects of care such as the level of family participation incorporated into treatment, the quality of Oxford's holistic treatment offerings in comparison to their competitors, and the likelihood that they would refer a loved one to Laguna for treatment. Operated by American Addiction Centers and set in a remote, lakeside setting in Etta, Miss., Oxford Treatment Center offers programming for adults struggling with substance abuse and co-occurring disorders. While the Etta-based facility specializes in providing medically-supervised detox and residential treatment, additional centers in Olive Branch, Tupelo, and Oxford offer intensive outpatient treatment (IOP) and continuing care. According to its website, Oxford guarantees a complimentary 30-day stay to any client who relapses after completing 90 days of treatment. Depending on the severity of their condition, clients may begin their treatment with medically managed detox. During this period, clients receive 24-hour supervision and medication to ease the symptoms of withdrawal. Once stabilized, individuals move on to Oxford’s residential program. The residential program is based on 12-step principles and includes individual, group, and family therapy. Oxford’s website indicates that most clients meet with a psychologist or psychiatrist twice a week, though extra sessions may be scheduled as needed. In the evenings, residents attend 12-step meetings. Additionally, the facility employs a variety of holistic, experiential, and alternative treatment modalities, including art and music therapy, equine therapy, and wilderness education. At the conclusion of treatment, clients are provided with an aftercare plan that may include additional treatment through one of Oxford’s outpatient centers. According to its website, Oxford Treatment Center’s staff includes physicians, psychiatrists, psychologists, nurses, social workers, and counselors. Oxford Treatment Center is comprised of eight large cabins total set on 110 acres of wooded land. The property includes a private lake, outdoor meeting areas and walking trails, a fitness center, and an equestrian center. Residents sleep in cabins equipped with semi-private bedrooms with attached bathrooms, a common area, and a laundry room. Electronic devices are not permitted on-site. Residents may have visitors (subject to their therapist’s approval) on Sunday afternoons. Fifteen of the 23 alumni polled by Rehabs.com reported positive experiences with Oxford Treatment Center, while eight alumni expressed disappointment. Those who submitted negative reviews typically complained about the staff. Multiple individuals felt that the medical team was understaffed and that some nurses and counselors were uncaring. “The nursing staff is extremely rude and unprofessional. They made me feel very uncomfortable and not cared about from day one…They only have one doctor for the entire center which creates absolutely zero personalized care,” Dan wrote in a representative review. Some alumni were also displeased with the facility’s accommodations and provided meals. “This place is beautiful on the outside but hideous on the inside…The beds at this place are 100 years old and half of the residents went without pillows despite the $40,000 a month they are paying. Food is very low quality,” an anonymous alum told Rehabs.com. However, those who submitted positive reviews of Oxford Treatment Center praised the staff and program’s treatment effectiveness. Multiple survey respondents credited the facility with saving their lives. “Oxford 100% saved my life. I know my own treatment depends on what I put into it, but the combination of facilities, staff, and program made it so easy to concentrate on my own recovery,” Jason wrote in a representative review. Alumni characterized the staff as “friendly” and “concerned,” and multiple reviewers expressed appreciation for the counselors’ personal experiences with recovery. “The staff has recovery time also, meaning they don't just explain the recovery process from a book they also lived it,” Danny wrote in a representative review. The four loved ones polled by Rehabs.com at the time of this writing submitted positive feedback, indicating that they would recommend the facility to others. Reviewers gave the program’s treatment effectiveness four- and five-star ratings, based on a scale of one to five, and specifically praised the “caring” staff and the family program. “I completed the Family Program and it was so touching, informative and a life changing experience. The staff absolutely opened my eyes to so much that I hadn't seen before,” D.H. wrote. W.T. shared a similar experience. “Our family learned a lot about addiction, mainly how to support our loved one effectively while establishing boundaries. It has been an integral tool in the healing of our family,” they told Rehabs.com. According to its website, Oxford Treatment Center accepts most commercial insurance plans. As part of the admissions process, staff ensure that each client understands the cost of treatment prior to entering the program. The staff was so caring. The psychiatrist gave up. If it was not for the staff I would have given up long ago. I would return to this facility. Morning meditation and small groups. I did not like the psychiatrist. My daughter attended this facility was an opiate addiction. It was at the point we did not know if she was going to ever be seen by us again and she showed up and chose to go to treatment. We searched and searched and came across this by luck and grace of God. It was a struggle at first although it always is through detox for my daughter but she is alive, and has been clean for almost 18 months. I owe my daughter's life to this treatment facility, who took the time and had the hearts to help her, to achieve sobriety. Thank you goes out with all my heart to the staff at Etta they were amazing with her and me upon my visits I couldn't ask for a better place or faculty to have went through this process with. There are many different skill levels of counselors and faculty. Everything from highly trained to past users with experience that can give scenarios as to where you are headed if you don't stay clean. They have different programs for family to come, different programs for clients to do either their offer a variety of things as long as you are holding up your end and taking your classes you have to participate to be able to get privileges. Which is the way life works so it's a good learning experience also. You asked if it was worth the cost is saving your daughter's life have a price? At this point I do not know any weaknesses I was not there so I do not know what if anything they are lacking I can just go on the way she responded to treatment and the way she is now. Hello, thank you for taking your time to leave a review about your experience. We value your feedback and are very upset to hear about this! Dining is set up as a food service line with meals made by an executive chef and all programming is designed to serve patients as effectively as possible. We will take note of your feedback and reference it to make internal improvements. We wish you all the best in your recovery moving forward. Go somewhere else. I got out and learned nothing. However in a therapeutic environment this is not healthy. This was such a waste of my time and money. Please don’t make the same mistake. I tried asking to make a call to my insurance company to tell them I wanted to switch centers, after talking to about 4 people at OTC and I was denied to do so. Look somewhere else. Hi TC, thank you for taking the time to leave a review. We are saddened to hear that you did not have a good experience while at the Oxford Treatment Center. We do strive to serve our patients to the best of our abilities and hope to make their stay as pleasant as possible. Absolute disaster. I was there 3 months ago and was almost having a panic attack every day due to the lack of professionalism, lack of and respect. If you want help go somewhere else. This place is a waste of money and will do nothing for you. Especially if you are Under 26. They make you waste you’re time with 18 year olds who are court ordered to be there. However the nurses are the only ones you can really go to. Or one BHT. Anyone else don’t bother. Go somewhere else. Thisnplce is a waste of money. A horrible experience.They claimed 24/7 medical available and the RN refused to change my dressing on my shoulder after 3 surgeries. They would not give me my prescribed pain medicine because my bottle was empty, but I was told not to take actual narcotics across state lines so I just brought the bottle empty. They accused me of abusing the pills????!!!! I could have snuck anything in but I am honest and want to follow protocol. My needs are chronic alcoholism, depression and severe anxiety NOS, but they gave me nothing. Again I had meds at home. I had several panic attacks while there and a mini seizure (syncopy) that left me disoriented and unaware. It was so scary, my husband came and got me and we drove the 7 hour trip home. I have not had a drink in 20 days and my sponsor, pastor and psychiatrist are part of my support group. No more cheesy treatment centers for me. I can afford one of those spa like rehabs, but I can do this with my support and faith in a living God. I would not send my worst enemy there ( if I had one, which mighRN). JH, thank you for leaving feedback. We appreciate that you took the time to share your thoughts. Please know that we are truly sorry for any hard feelings you have towards us. There is a reason behind every decision we make in our facility and the reasons are always in interest of the person seeking treatment. We encourage you to contact us directly about this or any more concerns you may have. Due to HIPAA, we cannot address such situations publicly. We hope to hear from you soon. OTC was the worst treatment center that I�ve been to. I have been to a few, and I left against medical advice because this place was that bad. Everything was horrible. I was in detox for two days because they had so many new ppl coming in. This place should be shut down it is so bad. DONT GO HERE EVEN IF YOUR LIFE DEPENDS ON IT!!!! EVERRYTHING. Sam, we appreciate that you took the time to share your thoughts with us. We are truly sorry if you fell this way. Oxford Treatment Center is committed to providing quality, client centered care and we strive to provide this to each person who seeks treatment with us. We have helped many, many individuals. We hope you find the right treatment center for you. Best of luck moving forward. There needs to be more consistency between the staff on rules and guidelines. It is sometimes hard to communicate with different departments on campus. Family weekend is a great tool, would have loved a bit more examples for husbands and wifes, but I understand that a lot of adolescence where on our weekend. Over all still believe this place helped my love one. Family Weekend. Communication. Consistency with information given to patients and family. Shannon, we really appreciate your review. It is helpful to hear both your praise and your constructive feedback. Communication is highly valued here and we want to be sure that is clear. Your review will be helpful when we prioritizing improvements that will make our treatment program even better. We wish you all the best moving forward. I thought the counselors were good, I liked the program structure with the individual meetings with the counselors and the group meetings and the recreation in particular the Equine Therapy. The counselors, the location, the equine therapy, the detox facility, the nursing staff and doctors, the group meetings. Food, smoking everywhere outside, it seemed like they had a lot of free time between meetings. Perhaps more physical exercise would be beneficial. Frankie, thank you for leaving this review.We appreciate sharing both your praise and your constructive feedback with us. Your review will be helpful when we prioritizing improvements that will make our treatment program even better. We wish you all the best moving forward and hope that you keep in touch! I received treatment here for 32 days. The staff treats you like you are in prison. The facility is very disorganized. I was told right out lies when I contacted the call center for treatment. I now owe thousands in lab fees that are not covered by my insurance for peeing in a cup (supposedly randomly) at $1,500.00 a pop. The kitchen was not prepared ,for myself or others with food restrictions. There is no consistency regarding anything! I would not recommend this place to anyone. Tami, we are glad you had an opportunity to share your thoughts. We are truly sorry for any negative experiences you may have had. Please know that it is our mission to get people on the path to sobriety. We offer everything we can to provide the most effective treatment possible. If there was any miscommunication over the phone we apologize. You are more than welcome o contact us directly with any other questions or concerns. Best of luck to you. I praise this facility for giving my husband back to me and the father to my two adult daughters as well our new grandson. Due to the severity of his illness he missed the birth of his first grandchild, this was the last straw to the realization he needed help quick. This facility did everything in their power with my husband�s willingness to get well . I cannot say enough about the positive results along with my husband�s determination. I will forever be grateful to this facility and the employees from the initial call to the continued checks even after release. I recommend this facility to anyone needing this kind of rescue. Thank you for leaving this review. We are so happy to hear that your husband is doing well and that he received the knowledge, tools, and support he needed to get on the path towards recovery. We are appreciative of your recommendation, best of luck to you and your family. I was a patient here, and first of don’t believe everything they tell on the phone they don’t have computer labs or other things they may imply. Also most of the staff is good the housekeeping is horrible. What made matter worse is during my time there they had a bed bug problem that took way too long to fix. Think twice before coming here. NK, we are appreciative you took the time to share your feelings. We are truly sorry if you you feel that you had a negative experience at our treatment facility. It is our priority to provide a safe, comfortable, and efficient environment for people to achieve sobriety. Your feedback has been heard and will be addressed. Best of luck moving forward. Most of the staff went over and beyond the level of service expected. I want to give a special thanks to the kitchen staff, they made it feel like home. Jeff, we are so happy to read your review. Thank you for writing it. We hold our staff to very high standards and are proud to see it is being recognized. All the best to you and your journey. Please consider joining our alumni group! Casey, thank you for taking the time to leave this review. We are truly appreciative of the kind words and are glad you had an overall positive experience. Please keep in touch through our alumni group. We wish you all the best! The staff of Oxford Center were extremely supportive and concerned. The group starts were informative and gave me a variety of tools to maintain sobriety. Chandler, thank you for the positive review. We are very appreciative. We are incredibly proud that it is so apparent how much our staff cares.It is fantastic that you feel you have gained the tools to help you on your journey. All the best to you! Thank you JJ for leaving your comment. We always love to hear positive feedback. Best wishes. I can honestly say this is the best treatment center I have ever been to, and it truly saved my life. The staff is amazing and they really do care which makes a difference. This place is amazing, but only if you WANT recovery. How true that is Shelby. You have to WANT it, and it seems that you did. We are so grateful to you for leaving your feedback. We wish you nothing but the best and hope that you will stay in touch through our alumni group. Oxford 100% saved my life. I know my own treatment depends on what I put into it, but the combination of facilities, staff, and program made it so easy to concentrate on my own recovery. They give you intense therapy in a serene setting that allows for maximum time and opportunity for real progress and long term sobriety. I should know, a week ago I made one year clean and sober. Always looking forward and one day at a time. Jason, I love this comment. Congratulations! 1 year sober is defiantly something to celebrate. I wish you nothing but many more sober and happy years to come. The best thing about this place is the therapist that I as assigned to... She is very stern but also compassionate and helped me to deal with my denial. She held my feet to the fire and her small group was very helpful with lots of education about addiction. Best therapist I ever had. Great advice and listens to you without judgment! It is great to hear that you had such a good rapport with your therapist. Thank you for leaving your comment. We hope that things are continuing to go well for you and that you will join our alumni group to stay in touch. OTC saved my life. Yes it's not a luxury resort but that's not what you need to get the help you need to start recovery. In less than one month I will be one year sober. I made friends that will last a lifetime and could not recommend it more. It was kind of like summer camp and I mean that in the best way possible. Kitchen staff went above and beyond to accommodate my dietary needs. The counselors were great but could use more work in the aftercare department. Special thanks to those who got me there in the first place! Thank you for taking the time to leave a response. Congratulations on your one year recovery anniversary. That is defiantly something to be proud of. We wish you nothing but the best and hope that you will stay in touch through our alumni group. Today is actually my 1 year thanks to the Oxford treatment center in etta and there oxford sober living! I learned a lot about myself while I was there and different coping mechanisms. Everyone there treats you like family. The treatment team is fantastic so is the kitchen staff! Most places you don't get to meet the owner but I got the chance to meet Mr him and he is a great guy! I loved this place and it definitely helped save my life! Thank you to all the counselors and staff for everything that you do! 1 year and counting! Congratulations! 1 Year is definitely something to celebrate!! We are so proud of your accomplishment thus far and wish you nothing but the best. Please don't hesitate to reach out to us if you ever need anything. We also would love for you to join our alumni group, if you haven't already. We love to stay in touch and to be updated on former patients recovery journey. IF YOU WANT A CULT LIKE EXPERIENCE THEN THIS IS THE PLACE FOR YOU OR YOUR LOVED ONE!! THIS PLACE IS IN THE MIDDLE OF NOWHERE!! I HATED THIS PLACE,EVERY SINGLE SECOND OF EVERY SINGLE DAY! THEY PUT YOU IN A BEAUTIFUL DETOX CABIN TO REEL YOU IN AND YOU EAT FOOD PICKED FROM THEIR GARDEN. THE FOOD WAS SO HORRIBLE I WENT DAYS WITHOUT EATING BECAUSE IT WAS THAT NASTY THEN WHEN UR DONE WITH DETOX YOU HAVE TO MOVE TO A CRAPPY CABIN THEN YOU MOVE A THIRD TIME AND ALL THE GIRLS ARE IN "CLIQUES" THEY DONT MAKE YOU FEEL WELCOME AT ALL!! THEY DONT ALLOW YOU TO CALL FAMILY WHEN UR UPSET!! THE ENTIRE EXPERIENCE WAS HORRIBLE DISGUSTING N PATHETIC!!!! CM, thank you for your response. We are sorry to hear that you did not have a positive experience at our facility. A normal treatment stay at the Oxford Treatment Center is a stay in detox and then to move once to a residential cabin where the patient will remain for the remainder of their treatment. We do have a summer garden that is kept up by patients that enjoy gardening. Occasionally, foods from the garden may be used in a meal to help patients feel pride for their accomplishments in growing foods. We try to make every attempt to make patients stay at our facility as pleasant and beneficial as possible. With that being said, we do wish you all the best and hope things are going well for you. This place was amazing. Our son was there 2 years ago. He recently relapsed and immediately he called Oxford himself and arranged to go back. They had him on a plane within hours to come back for follow up treatment. They go above and beyond. Thank you for your review. We take pride in our efforts to help our residents whenever we can. We hate to hear that he relapsed but are grateful that he chose the Oxford Treatment Center to help him get back on track. Please know that we are are always here to help in any way we can and we encourage him to join our alumni network. This place is beautiful on the outside but hideous on the inside. Definitely a money making scheme. The director of counselors and only has 3 years of sobriety. He is a very self centered. Egoist with no heart for the patients. The beds at this place are 100 years old and half of the residents went without pillows despite the $40,000 a month they are paying. Food is very low quality. OTC is Definitely putting more effort into the facade and less I to the patients and program. Thank god I got through it and am now into an excellent program in California. I do not recommend this treatment center. Thank you for taking the time to leave a review. We do hate to hear that you did not have a good experience while at the Oxford Treatment Center. We do strive to serve our patients to the best of our abilities and hope to make their stay as pleasant as possible. Some areas of our campus are dated and are in the process of being updated while most areas of our facility are now completely new and/or less than 5 years old. As far as meals, we are always looking for different menu items and do take suggestion from patients into account when making menus. We are sincerely glad that you are enjoying your program in California and wish you all the best in your journey in recovery. Thank you so much for your response. We are so excited we could give you the tools you needed to set you on the right path. We hope all continues to go well for you as you continue your journey. Make sure to join our alumni group. We would love to continue to hear from you. I was so glad that I came to the OC. I learned a great deal about myself as an addict. The OC gave me the foundation I needed to continue fighting,. The people I met were some of the greatest and caring. Thanks for your response JD. We are so happy that we were able to help you establish the foundation that you needed. We hope that you are continuing to do well in your journey of recovery. Please make sure to join our alumni group. We just had our 5-year anniversary alumni celebration this year and it was great to see everyone. This is a terrible place to be. I was treated like a child. I'm 48. I'm a grown woman. I have been clean for two years, but not because of a damn thing this place did, but because when I got out, I decided I wanted to be a better me for my two daughters. The staff is inordinately rude and uncaring, and my counselor broke my trust to the point that I have been unable to trust anyone since I got out in April of 2015. I was treated as though I didn't participate in my treatment just because I am a very quiet and introverted person. I always have been. As far as one staff member is concerned, she is a despicable human being. She lied to my family, and treats all patience like they are not individuals. Due to medical issues, I have been unable to sit in the same position for any length of time. During her lecture, she was publicly rude to me about it so I politely excused myself from the lecture. She later told my children I had an attitude problem. This facility does not care about the individuals. Please, please, do not attend this rehab. Go somewhere that you are treated with love and respect....human kindness. Adrian, thank you for your response. I am sorry that you did not have a good experience while at the Oxford Treatment Center. That is never our intention. While we certainly know we are not perfect, our staff is 100% dedicated to recovery and guiding each and every person to a successful life of sobriety. That being said, We do hope things are going well for you and that you are continuing on you journey of sobriety. I loved the Oxford Center. Being there changed my life. I now have over 3 years clean, when I used to not be able to get 3 days. The detox was the best I've ever had. I was kept completely comfortable and the groups and therapy helped me deal with things I'd ever even talked about before. The staff was friendly and loving as I went through one of the hardest transitions of my life, and helped show me a life worth living. We are so glad that we could help shine a light for you in such a difficult time in your life. It is what we work hard to try to accomplish each day. Thank you for taking the time to leave your review and wish u great things ahead. Please feel free to tap into our alumni group if you haven't already. Thank you for taking the time to leave a review for The Oxford Treatment Center. We always love to hear positive feedback from our former patients. It builds us up and helps us keep pressing on so that we can help the next patient that comes in our doors. We wish you nothing but success in your life as you continue on your journey of recovery. If you haven't already, make sure and join our alumni group. Thank you for your response JJ. I do apologize for any miscommunication that you may have experienced while in treatment. We strive to communicate truthfully with the families of patients who are in treatment, though we do not speak with any patient’s family/friends unless the patient has signed a release form for staff to speak with them. I also apologize for the misleading information that you may have received regarding your insurance. We do not always know exactly how many days a patient’s insurance with allow a patient to stay in treatment. We call a patient’s insurance company every 1 to 7 days (however often their insurance requires) to authorize as many days as possible. When those days have passed, we continue to call and authorize more days until the insurance company will not allow anymore. That is when we notify the patient and/or family to discuss options. We do hope that things are going well with you in your recovery and hope that you will know that we are here for you if needed. My experience at the Oxford Center was interesting to say the least. The nursing staff is extremely rude and unprofessional. They made me feel very uncomfortable and not cared about from day one. They will openly talk about other patients personal information right in front of you, it blew my mind. They only have one doctor for the entire center which creates absolutely zero personalized care, which is something I needed at the time and was very disappointed. This place is no more than a very expensive summer camp for you or your insurance company. They let the patients run the show. The entire staff besides three people I can think of cuss all the time and act unprofessional day in day out. I completed their 45 day program then went to their sober living house. It houses I believe 13 or 14 men there's only two small fridges and very little cabinet space. What you need to do is keep as much of your food as you can in your room because it will get eaten by someone else if you put your name on it or not. The aftercare iop program is a poorly uneducated run facility. Favoritism is always at an all time high at the in patient rehab and sober living. It was a miserable experience being to end. My advice is they're are so many very well run highly educated rehabs in America, don't waste your time or money on this one. Dan, Thank you for bringing your concerns to our attention. We apologize that you were under satisfied with your experience at the Oxford treatment center. Please be assured that this is never our goal in patient care. We train our staff continuously on professionalism, courtesy, and competency and strive to show those characteristics daily in our interactions with patients. As you stated we do have 1 doctor who is our medical director and specializes in psychiatry and addiction medicine, but we also have a psychiatric/mental health nurse practitioner as well as 3 certified nurse practitioners who all see patients on a regular basis. We are in the process of building a brand new outpatient campus with new sober living houses and hope to have that open by the middle of 2017. Once again, thank you for your response and we wish you well in your journey. The staff are concerned and they have compassion. The staff has recovery time also, meaning they don't just explain the recovery process from a book they also lived it. Thank you, Danny, for taking the time to write a review for our facility. As you said, many of our counselors are in recovery themselves and their compassion and concern comes from knowing first hand what it is like to be in active addiction and in early recovery. We hope that you will stay in touch join our alumni group if you haven't already. It is always an encouragement and a help to be around like minded people. Caring staff Located in a serene environment. Great facilities. Maybe catered more to younger patients. Had a family member go to the facility. Our family learned a lot about addiction, mainly how to support our loved one effectively while establishing boundaries. It has been an integral tool in the healing of our family. Thank you for your review. Our patients and staff love our serene campus settled back in the Holly Springs National Forest of Etta, MS. We believe that a patient’s family is a major factor in successful/long-term recovery of our patients and encourage all patients and families to attend our family program. We hope all is well with you and your family member. Best wishes. Family program is absolutely awesome. Also their Sober Living program is wonderful. Since I wasn't a patient there I did not experience the day to day program. However my son said it was one of the best programs anywhere. I completed the Family Program and it was so touching, informative and a life changing experience. The staff absolutely opened my eyes to so much that I hadn't seen before. Thank you for your review. We believe that a patient’s family is a major factor in a patient’s successful/long-term recovery and pride ourselves on our family program. We are so glad that your son enjoyed his experience while in our treatment facility and hope that he has great success in his recovery. The nursing staff overall is ok two of the women are always sitting around doing nothing and one woman is very rude and hateful towards the patients she talks to you as if you're a criminal in a jail or something. One of the male staff members is so slow at med pass and it always takes forever to get our meds. Most of the time I think that half the staff has no clue as to what's going on or what to do. The food has its days it's not always so great. The fish is terrible and they should really stop serving it but I guess when you are hungry and have no other sources to eat you do what you have to or starve one. I really think they should have options not just one dish and thas it take it or leave it. I love one of the male staff members, he's great. Overall I think this place is a joke. People have gotten countless write ups and have stayed. Thas why the patients feel like they can do whatever because nothing ever happens to them there are no consequences for your actions here. How can you get quality treatment here with all this chaos going on? I don't think I would send my worse enemy to this place. Ks, Thank you for your response. I do apologize that your experience at our facility was not to your liking. I assure you that employee behaviors and write ups are taken seriously and are monitored and addressed per our facility policies. I will be sure to notify our chief of your concerns with meals/food. We do sincerely hope that you are doing well and you are pushing forward to be successful in recovery. This place has been such a blessing to my family! My daughter got the help she needed to live a clean and sober life. Thank you all for the work you do. We are so grateful!! You helped me give my kids the mommy they deserve! I was a 20-year addict and alcoholic. You gave me the life I deserve! Sober since 8/21/12. Thank you for your response. We are so glad we were able to help you become the person you aspired to be. It warms ours hearts to know that we are saving patients lives as well as helping families to become whole again. We are delighted that you felt that we were kind. Thank you for your response. Please let of know if we can ever be of assistance. There were only 2 people who had the proper credentials to be a substance abuse counselor including being in the field for near 30 years. The levels of unprofessionalism from most of the staff was unbelievable! The medical staff was highly understaffed. Extremely understaffed at the nurse and doctor level. Nurses had an attitude of indifference as did one of the two doctors..They also seemed to not care for the patients and severely lacked in bed side manner. I was displeased with the psych treatment- it wasn't at all the focus. Doctor decided what he'd administer far too quickly. I needed to be as far away as possible around people who are as open minded, enjoys the arts, supports human rights, etc. I've never found any of that in Mississippi. They actually exceeded my expectations because I went to treatment originally to just dry out for a month. I didn't go with the intention of lifelong complete abstinence. I truly thought that such a significant period away from substance would help me to use smartly. I think that I've identified the major flaws that I experienced and really do not want to look back at that any closer than I have today. I will say that the head counselor is one of the most intelligent and compassionate humans that I've come across in my life. He is the sole reason why that place still exists in my opinion. I think that you'd find many that mirror that evaluation of this particular person. The care and professionalism of our staff is a point of pride at The Oxford Centre. We profile the credentials and experience of all our primary therapists on our website. Our medical staff and leadership are profiled as well. Featured interviews with our staff further illustrate their knowledge and commitment in helping people overcome addiction. Made it fine while in detox after moving they put me in cabin with adults instead of youths. Tried to stick it out but could not sleep due to bugs in bed. ... I checked myself out. I came here for help and to get away from people like this. Would not recommend this place to anyone needing help.